British chocolate is right up there alongside Swiss and Belgian as the best in the world. Seriously. American chocolate tastes like earwax in comparison. I've yet to meet an American who, having tried British chocolate, doesn't agree with me. Sister missionaries are fun to try it on - their faces when they first bite into a bar of Cadbury's Dairy Milk are always quite the picture. Christmas is much bigger over here, and lasts much longer. My office will close on 23rd December and not reopen until 2nd January, and that break doesn't come out of my holiday entitlement (see below). Not only is Christmas Day a public holiday with almost everything closed, but so is Boxing Day, the day after. And New Year's Day. All the best films and Christmas specials are on television, and there's a dizzying wealth of traditions, from mince pies and Chrismas pud to carols by candlelight and Christingle. It probably helps that we haven't just had a big family celebration involving a turkey. In fairness, America can't really help the fact that it doesn't have much in the way of history, but we do laugh over here when we hear American sites designated "historical" when they're barely a hundred years old. 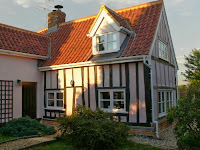 My parents' house was built in 1491, it's not a historical attraction or a museum, and they live in it. 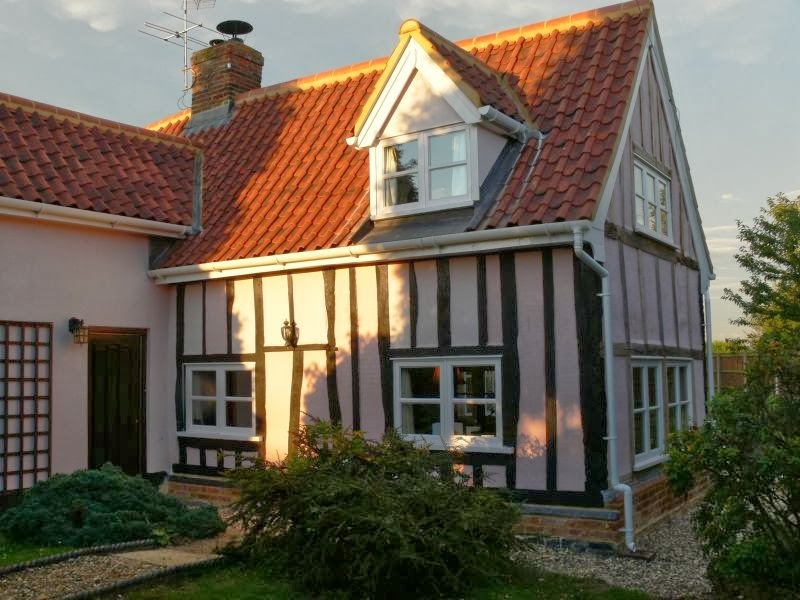 It's no big deal, because there is no shortage of homes available which date back several centuries and have the character to match. America is one of only two first-world countries that doesn't offer statutory paid maternity leave. Over here we're entitled to - get this - up to a year off work, with a guaranteed-by-law job to return to afterwards. For the first 39 weeks you get paid 90% of your salary, after which the pay goes down incrementally. It costs the employer nothing because the government not only reimburses the salary paid to the absent employee, but pays more than that 90% in order to cover the additional expenses involved. 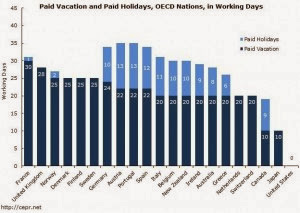 Similarly, America is the only western country not to require its employers to provide mandatory vacation time, and apparently one in four Americans gets none at all, although most get one or two weeks per year. This caused some problems during one of our visits to Florida when we tried to book our apartment for two weeks. Their computer system just wasn't set up for people to come for two weeks at once, and we ended up having to move to a different apartment halfway through our stay. 1. You do know we have Cadbury’s over here too, right? 2. Has Christmas started over there yet? ‘Cause here it started the day after Halloween. All the days off for employees sure are nice though! The only ones who get all that time off here are the kiddos. But my husband usually uses one of his weeks of vacation to take off the week between Christmas & New Year’s Day. 3. True, so true. I used to work at Colonial Williamsburg and I remember a man from England coming into the shop and being very confused as to where all the historic buildings are. He said, “The house I live in is older than these buildings.” To be fair, it’s not really our fault. And also, we have some way cool native stuff that’s more than 8,000 years old, so don’t totally discount the history! 5. That’s really weird about your hotel not being able to handle the two weeks thing. I know plenty of people who go away for two weeks at a time, and the places we stay always allow for multiple weeks. The way my hubby’s job works is that the longer an employee works there, the more vacation time they accrue. I know many other companies have similar policies. To be honest, he usually has so much vacation time (he’s been with the company for over 10 years) that he doesn’t usually even use it all by the end of the year- and those weeks don’t include the standard holidays (Christmas, New Year’s, Martin Luther King Day, Washington’s Birthday, Memorial Day, Independence Day, Labor Day, Columbus Day, and Thanksgiving). Very interesting comparison, Anna! I like my gun, so don’t mess with that and I am beginning to feel nauseous every time I hear the word “healthcare” so thank you for avoiding that topic as well, LOL! 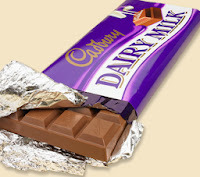 I did know about the Cadbury's chocolate, but when we had it there it tasted like American chocolate - Cadbury's change the recipe to suit the market. We theorised that they make it different because of the higher temperatures, so that it doesn't melt so readily. Christmas here starts before Halloween since we don't really do Halloween as much as America does. But at least it's incremental - just a few gift items in October, and then the whole Christmas Trees and cards and everything else in November. In my last post someone pointed out that the better houses and roads in America were just incidental to there being more space. So the history thing is the same; it's just incidentally to the fact that we've been here longer. This is really fun to read, Anna. I'm from Canada, so we have a taste of both of these worlds. Including British chocolate, which is so much better, it doesn't even compare. And you're right, they do change the recipes in the States. In fact, I'd give a kidney for a smarties blizzard right now.